Opportunities in the Bad News? HomeBusinessOpportunities in the Bad News? There’s been plenty of bleak news coming out of the equity markets and the U.S. economy as a whole. Are there opportunities hidden within that bad news? Are we now in one of those “blood in the streets” scenarios that Rothschild (and many investors after him) found so appealing? If you believe in the cyclical nature of markets, the chart from Stifel Nicolaus may be of interest. This chart shows the 10-year rolling return of the S&P Stock Market Composite going back nearly two centuries—current performance (inside the circled area) is at low levels only seen during the Great Depression. The negative news flow keeps many investors on the sidelines waiting for sunnier days, while those who believe that what goes down eventually comes back up may see an opportunity to snap up equities at bargain prices. A similar story line may be created for the next chart, which was produced by Old Mutual insurance company. The MSCI World Index is a measure of stock market performance across the world (including the U.S.). The chart shows how the growth rate can swing wildly based on global events, but what’s clear is that the negative rolling 10-year growth since 2008 is unmatched in the past four decades. Markets have always bounced back, and as you can see on both charts, the best gains tend to be posted early in the turnaround. One more data point—over the past decade, Treasury bonds have outperformed U.S. equities by nearly 90 percent. This is the widest margin of such outperformance over a rolling 10-year period in more than a century. J.P. Morgan points out that history shows equities eventually reversing that trend, and when they do, they on average climb more than 250 percent over 10 years—a compounded annual growth rate of 13.6 percent. The persistent bad macroeconomic news makes another round of “quantitative easing” (i.e., money injection) by the Federal Reserve increasingly likely. This could be good for equities by lowering long-term interest rates, stimulating the economy and boosting valuations. It’s often said that hope is not an investment strategy, and that’s certainly true. It’s also true that hopelessness is also not an investment strategy. 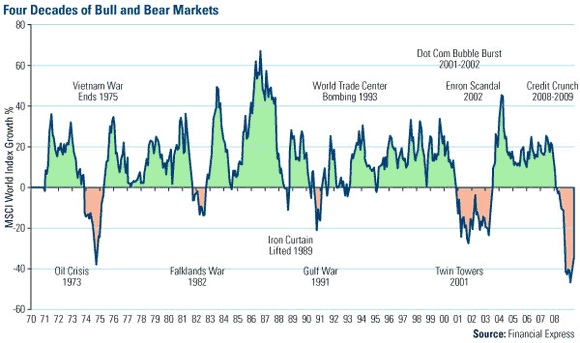 History and cycles are not perfect predictors, but it’s worthwhile to pay attention to these indicators. The S&P Stock Market Composite is a combination of major market indices used to gauge overall equity performance dating back to the earliest days of the market. Diversification does not protect an investor from market risks and does not assure a profit. The MSCI World Index is a capitalization weighted index that monitors the performance of stocks from around the world.